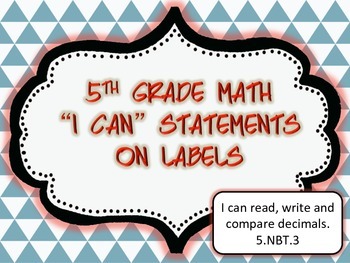 Included in this product are "I Can" statements on labels for ALL 5th grade common core math standards. 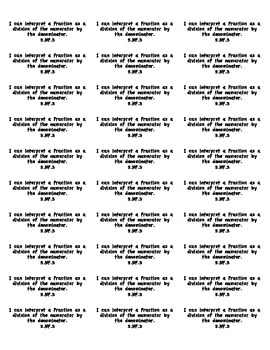 Print out the pages in this document on Avery 5160 labels. 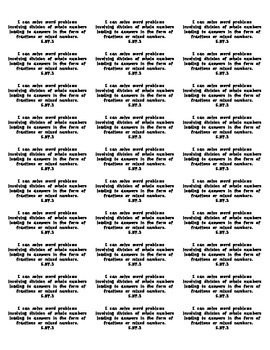 These labels would pair nicely with "I can" statements or common core math objectives hanging around your classroom. *interactive math notebooks/journals - give each student one label to place at the top of their journal entry. *organization for common core math activities, place on math centers, place on daily work that goes home to parents. *place in agendas that go home to parents to open up communication from school to home. Many, many uses for these labels. 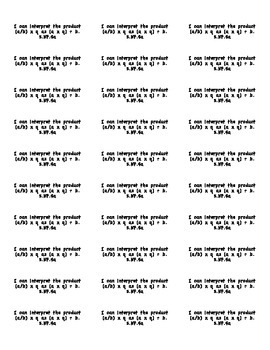 Each sheet of labels contains 30 labels of the same "I can" statement. So they are easy to pass out to students in the classroom. If you download the preview you will get 2 free sheets of labels to try out in your classroom. If you are interested in ELA standards in labels I can make those for you, just message me through TpT. Thanks so much for viewing this product.